We will uncover the basic beaded bracelet step by step process that will lead you ultimately to the 'how to' tutorial where you will be see how to actually create this project. I will be sharing with you what you need to ensure your success which will build your confidence to move onto the next project. So here is what we will cover. 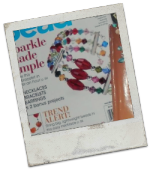 We'll look closer at the essential bracelet making supplies that are needed to make a basic beaded bracelet. 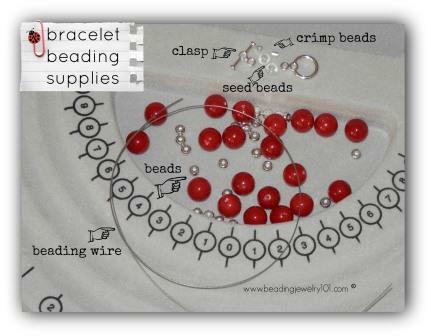 Only 4 components make up the supply list for the basic beaded bracelet. Simple enough don't you think? We will look at each in more detail. 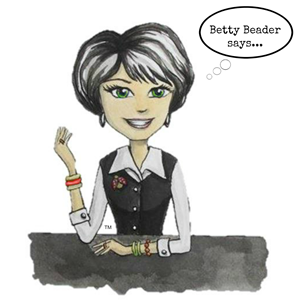 We will discuss at the jewelry beading tools section that there are only 3 basic tools total needed for any of the beginning projects. A beaded bracelet only needs 2 of the 3 tools discussed there. 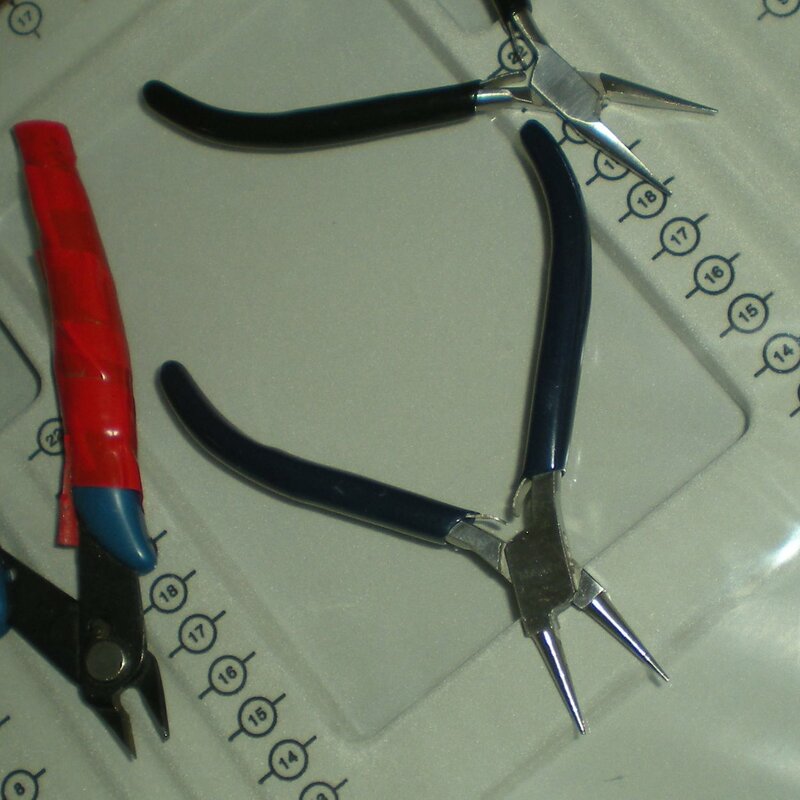 We will delve into the tools needed to complete the basic bracelet. You will see in the 'how to' tutorial just how each tool is used. The tutorial will be your last stop on your journey of learning how to make your first basic beaded bracelet. We will walk step by step through the entire process. If you should have questions by the end of the process you can always write them down and contact me. If you are ready to move forward then let's continue by starting the process with first understanding the anatomy of a bracelet. 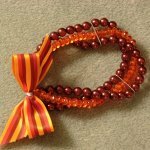 We will unfold together the basic construction of a basic beaded bracelet. 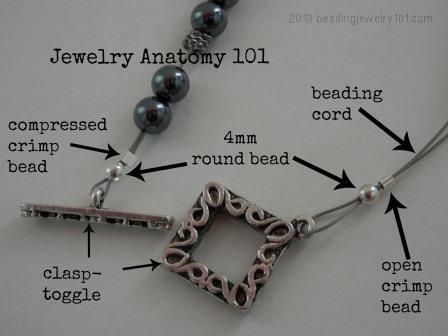 Jewelry Anatomy 101 is a course, or more of a concept, I created for all my students taking the basics to beading classes. It came from my own learning process. I found after many years of teaching the basics that this visual instruction of the construction helps to lift the fog about this simple process just like it did for me. Think of it as a science project where we dissect and investigate the inside of each specimen down to it's basic core. In our case, a basic strung bracelet. Once you learn the guts to the process you will never look at jewelry the same way again, you will see it with new eyes. Side note: I personally was never good in science but maybe if I had gotten to dissect jewelry rather than frogs I may have done better. 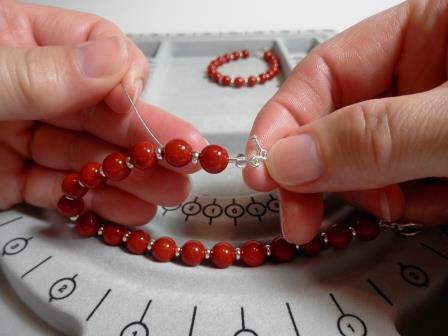 By the end, you will see the simplicity of jewelry making instead of what may appear to be the complexity of it. Let's begin with a little exercise and I'd like for you to make some notes so we can compare at the end. When you look at a beaded bracelet [pictured here] what are the first things you notice? Take a moment to consider. It's not a trick question and there is no right or wrong answer. I just want you to exercise what your brain registers to what your eyes are seeing. Pause for a moment here before you continue reading. We aren't in a hurry, take your time. Do you see it? Did you come up with anything different? Now let's take a closer look and let's discuss it. The color is grayish black or a charcoal gray with silver metal accents. The beads are a variety of shapes and sizes. 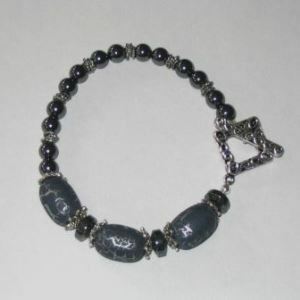 The closure is a decorative clasp in keeping with the design of the bracelet. The style of bracelet is casual. Is there anything else you noticed about this piece of jewelry that didn't make my list? What are the beads strung on? Let's look inside and see what's going on underneath the pretty beads that holds this piece of jewelry together. 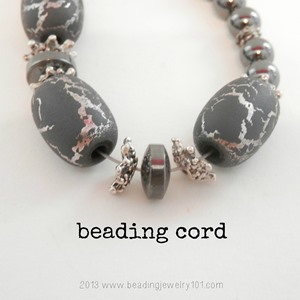 Well to start with, you may know that a stringing cord is what the beads are strung on, but what type of beading cord is it? That was the important question I am trying to get to. Now pay close attention here...are you listening? There are a variety of choices of stringing materials based on the project and we'll talk more of those choices as we work through more tutorials. BUT...for the sake of beginners when learning how to make your first bracelet I recommend you start learning with a stringing material called 'beading wire'. The beading wire of choice for beginners that I recommend is the brand 'Soft Flex Beading Wire'. I don't get paid to say that. From my own experience it's just what I have found to be the easiest material to use when first starting out. If you pay attention to nothing else please heed this advice. Of course ultimately the choice is yours but I couldn't continue without sharing that secret tip. I won't lie...It does cost a bit more but I am confident it will save you loads of frustration and provide you hours of pleasure through this learning process. It's worth the extra cost. I found this out the hard way. 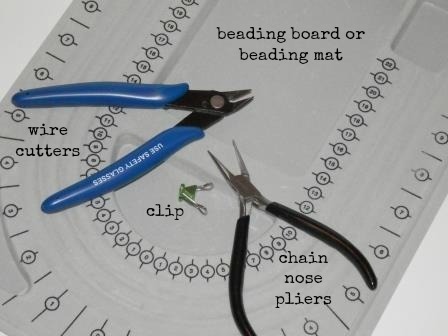 Once I discovered Soft Flex Beading Wire it left me bias to which beading wire to use. Read more on why I love Soft Flex Beading Wire and why you will want to make this your beading wire of choice as well. 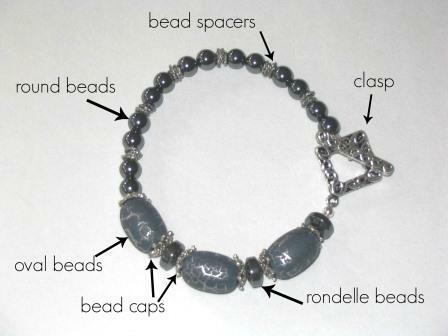 I said earlier you need just 4 basic components to create a beaded bracelet. This visual shows all the components in use. This picture could be a bracelet or a necklace or even an anklet. Each are constructed in the same manner, the difference is the length of each style. If you look at the small components closest to the clasp, that needs to be your focus as you proceed with this process. 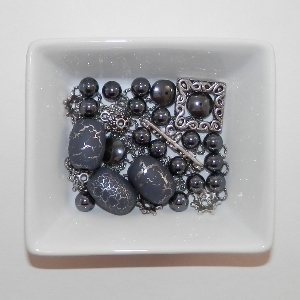 These are the key ingredients for holding the jewelry together and we'll talk more on that in the tutorial. 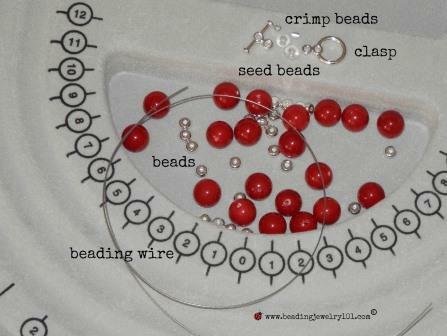 My intent here is that this visual helps demystify the process of constructing beaded jewelry. More specifically the basic beaded bracelet. So then...if you are ready then let's move on to learning how to make a basic beaded bracelet by looking further and discussing each of these components in supplies. Let's get clarification what each component is, how to use them and the purpose for each.